Campaigners for the abolition of child labor in India welcomed a Cabinet decision Tuesday which would ban the employment of children under the age of 14. The government's ministers called on Parliament to pass an amendment to the Child Labour Act 1986, a law which, until now, has allowed children below 14 to be involved in "non-hazardous" work. The amendment, if passed, would impose a maximum three-year jail term and 50,000-rupee fine for anyone employing a child under the age of 14 in any kind of work or engaging under-18s in hazardous work. The change would be the most significant development in India's child labor laws since the introduction of a partial ban in 1986, according to activists working for an end to the practice. However, activists also warned that without sufficient political backing, effective implementation, adequate budgets and robust enforcement, the amended law could remain on the statute book without any impact for the estimated 12.6 million under-14s working in the country. Kailash Satyarthi, chairman of the Global March Against Child Labor, said the change had the potential to strengthen a law that was "inappropriate and weak" at its inception and had become "redundant" as a result of contradictory legislation introduced subsequently. "The current law is contradictory to the Right to Education Act which guarantees free schooling to every child under 14," Mr. Satyarthi told India Real Time. He added: "We are concerned about the implementation of this [amended] law because most of the welfare laws in India are not enforced because of a lack of political will." As well as the need to remove contradictions from its statute book, the government is under pressure to meet the 2016 International Labour Organization's deadline for the abolition of the worst forms of child labor. Mr. Satyarthi, who is also founder of the nongovernmental organization Bachpan Bachao Andolan (Save the Childhood Movement) said there had been an encouraging change in attitude among the political elite towards the practice of employing children. "Image is very important now since India is promoting itself as the fastest-emerging economic power in the world," he said. "They can't afford legislation which goes against that image." The case of a 14-year-old domestic helper rescued by an NGO earlier this year after two doctors allegedly locked her in their apartment without adequate food while they went on vacation, also helped change the mind-set within India's political class, according to Rishi Kant, the coordinator at Shakti Vahini, the organization which rescued the girl said. After "that incident the government became sensitive towards the child labor," said Mr. Kant. "And within months, the Cabinet decision comes to ban all forms of child labor." Mr. Kant said that India needed a better mechanism for reporting and finding missing children to prevent child trafficking, which fuels the child labor industry. Figures released this week by the government said that 55,000 children go missing in India each year. "Parents are lured by the money that their children are promised for petty jobs in big cities but the parents never get the money and the child gets all sorts of problems and all kinds of exploitation happens to the child," Mr. Kant said. Both Houses of Parliament must pass the amendment before it becomes law. Cassie Dummett, head of programming at Catholic Relief Services India, said that a change to the law would strengthen the hand of those working at the grass roots to eradicate child labor. "We support projects in rural and poor India and are dealing with the police and Panchayats" or village councils, said Ms. Dummett. "If we are able to say to them, &#8216;This is the law, no child under 14 should be working' it would be very useful." 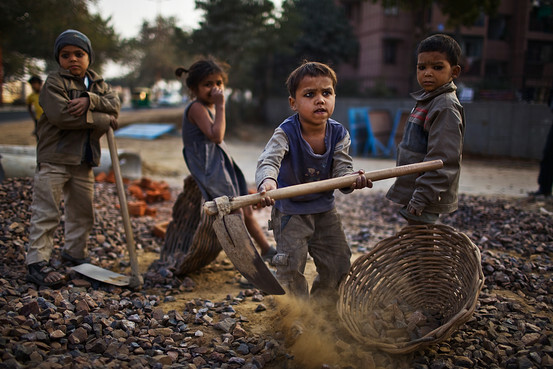 Sherin Khan, senior specialist on child labour for the International Labour Organization for South Asia, said the impact of the amendment, if enforced, would be "far reaching for the millions of children who are missing out on their development in a country that is now a global power." "For those needing assistance to do well in the formal school system there are a number of schemes, including the National Child Labour Project centres or bridge schools helping children bridge their path from child labor to education," Ms. Khan added. Mkuu siku hii sinto isahau, maana kweli jasho lilitutoka, halafu hizo fweza ulizo tupi aahk, maumivu tupu. Watoto kila mahali wanteswa sana Mwenyeezi Mungu awasaidie. Kama mzazi nimehisi mwili kusisimka vibaya sana, kweli tembea uone.